As with all showcases, our aim is to offer some insight in the different ranges that our out there. The included comments only reflect our opinions, but these are based on personal experience with the respective companies. The different manufacturers are listed in no particular order of preference. 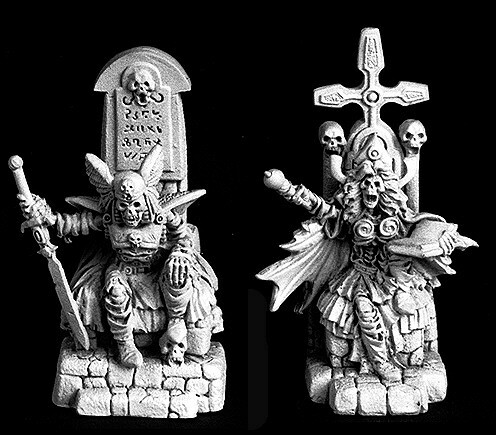 This company, which used to be called Icon miniatures (and before that harlequin miniatures), has almost everything you'll ever need in rank & file. 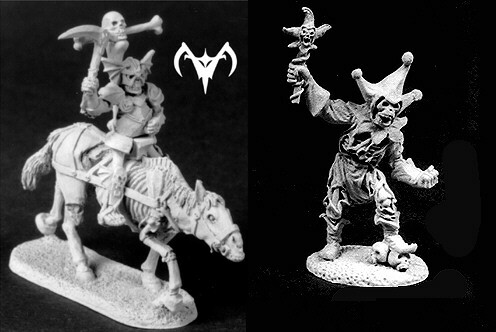 The ranges to look for are "Harlequin fantasy" and "Fantasy armies". 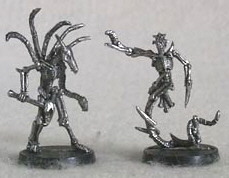 The models are mostly sold in packs of six, with 3 different models in each pack. They use plastic slotted bases in the standard sizes. The ranges are designed for wargaming and cover all of your basic needs. 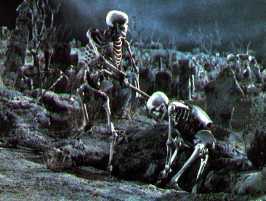 There are skeletons armed with spears, bows, hand weapons, halberds or scythes. The archers are my personal favourites. 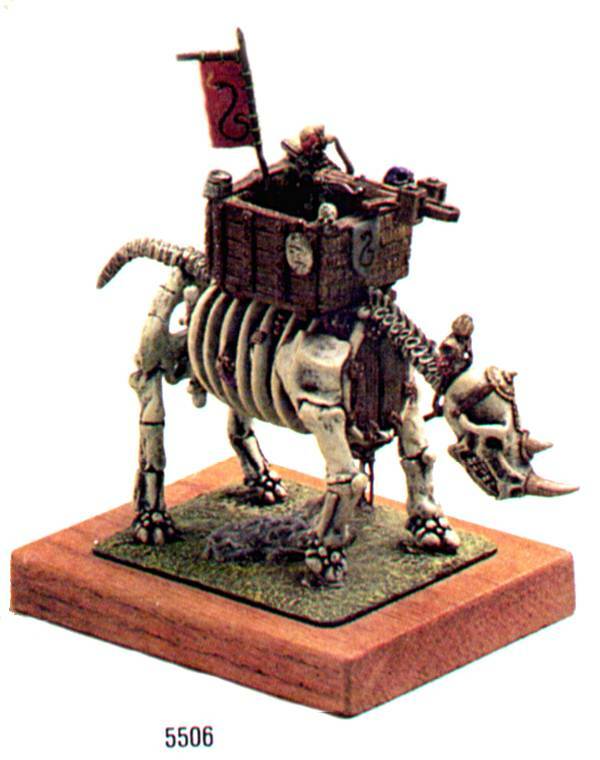 They also have armoured skeletons (The fa1012-ones are some of the finest in the range IMHO), mounted skeletons with bows or lances (horses are of the "rotting flesh" type) and command groups. Downside: You will always have to buy doubles in the blisters and that rule applies to the boxed warmachines too. No need to introduce them, is there? While many of the old ranges tend to be a bit small, the newer ones are just fine sizewise. 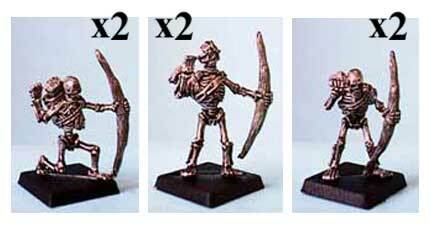 Though many of the older models are now out of production, you can still get the more recent ranges from Ral Partha Europe. Ranges to look for: "All things dark and dangerous" and "Crucible". Bases are slotted. Some are metal instead of plastic. The Crucible models have round bases instead of square ones. http://www.ralparthaeurope.co.uk/ Site has pictures of the models. 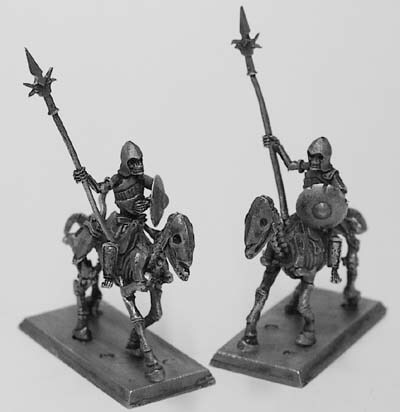 Intended for the "Battlestorm" wargame, the "All things dark and dangerous" line will meet most of your needs in the rank & file section, be it skeletal command figures, swordsmen, archers, spearmen, armoured halberdiers (code 02-180 and following) or skeletal knights with twohanded swords. 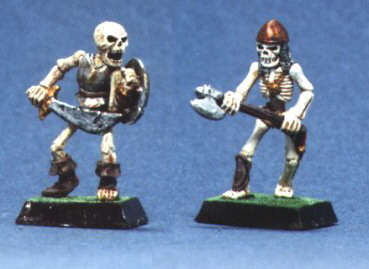 There's also a pack of skeletal characters. 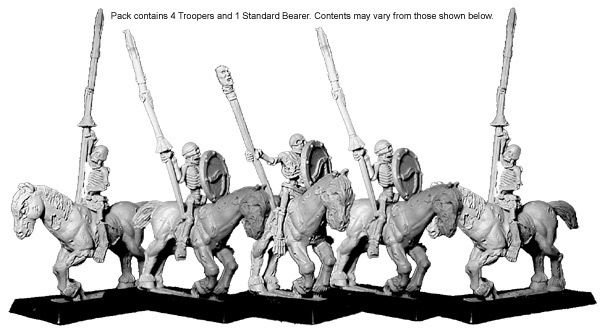 Mounted skeletons are avalable as well with spears or bows, with or without armour(02-186), including command (02-187).There used to be a skeleton bolt thrower as well, with 2 skeleton crewmen (02-190), but this seems to be OOP. 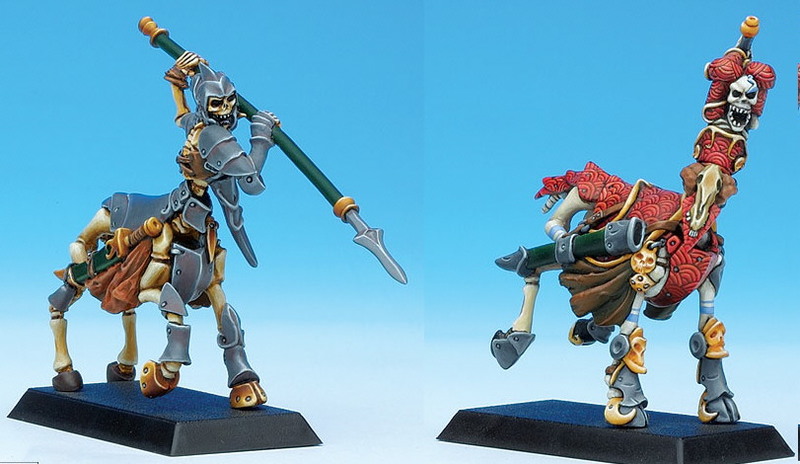 The "Crucible" line has fewer figures, but offers some nice characters, bone-constructs and a skeletal dragon. The "Dark Heaven" line is excellent for characters. Many vampires, wights, spectres, skeletons and other creatures of the night. Some of the undead tend to be a bit large, but that works well enough for characters. 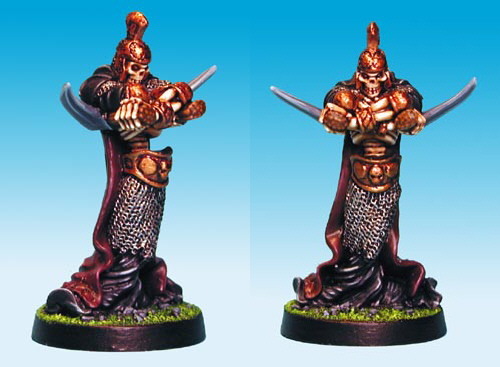 Don't forget to look at the new "Warlord" range either. Sculpting and casting is very good on most of these models. 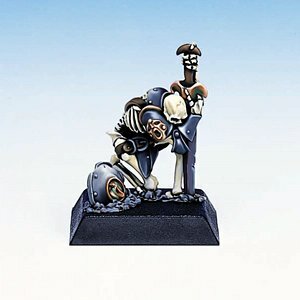 The "Dark Heaven" models do have solid bases. And I mean SOLID. I still think the models are worth the extra trouble of rebasing though. 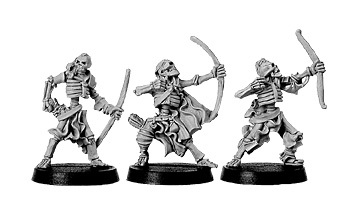 The Reaper website offers hollowed-out square bases to aid in this department. Site has pictures of all the models. 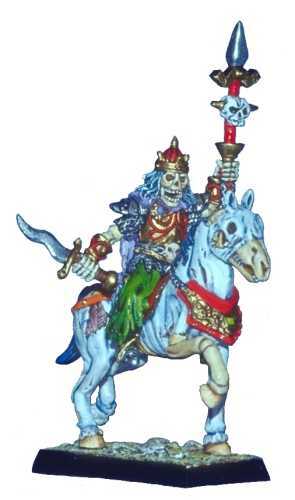 Here you will find armoured and unarmoured skeletons, a skeletal jester, hooded standard bearer, many mounted models, as well as a liche king and queen on throne. There are also a few boxed sets. There's the very nice dragon bone catapult with crew and a large Skeletal dragon. 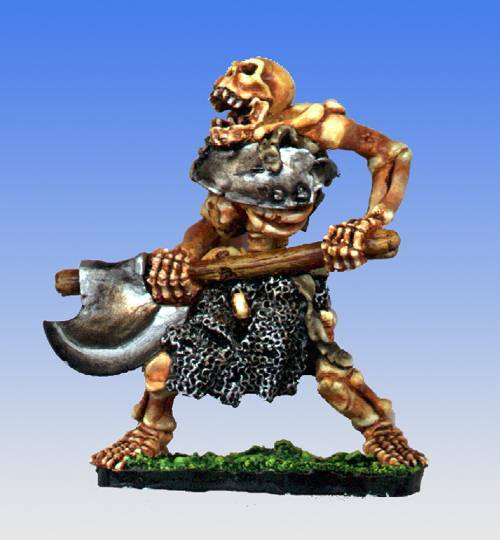 French manufacturer of resin miniatures. Some perfect size- and stylewise, some not even close, which doesn't mean they're not nice in their own right. Site has pictures of the models. 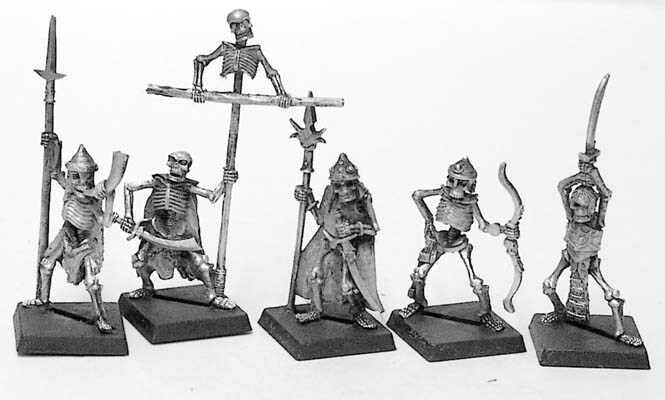 Other available models include more rank & file skeletons and a pack of 3 dwarf skeletons (fm19). � Bases: Solid bases. No problem with humanoid figures. Those have standard-sized bases. Bases on mounts can be somewhat small sometimes. But luckily, the resin is VERY easy to cut. Rebasing shouldn't pose any problem. This Russian manufacturer of mainly historical models in the 1/72, 1/35 etc... scales, has now entered the realm of the 28mm fantasy with their "Ring of Rule" game system. 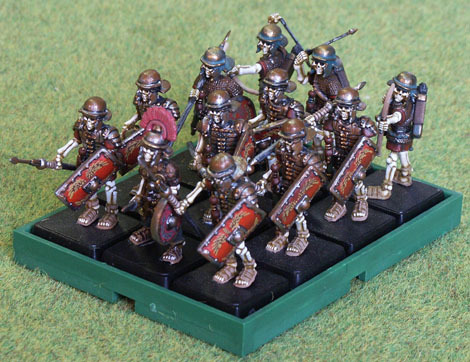 The undead are presented under the form of a skeletal Roman legion, returning from the dead to haunt the living. 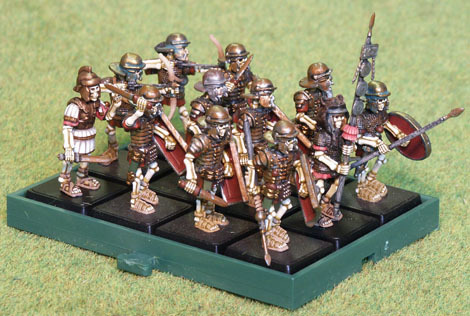 So far, the available models include the Cursed Legion infantry (24 models with full command), artillery and cavalry. No need to introduce the French manufacturer of all those wonderful Confrontation minis. Or else you should get off your remote planet more often. The range includes skeletal centaurs, skeletal angels, skeletal characters, rank & file skeletons and lots of weird stuff you may not even have a name for. The downside is that these can be a bit pricey, but well worth it. 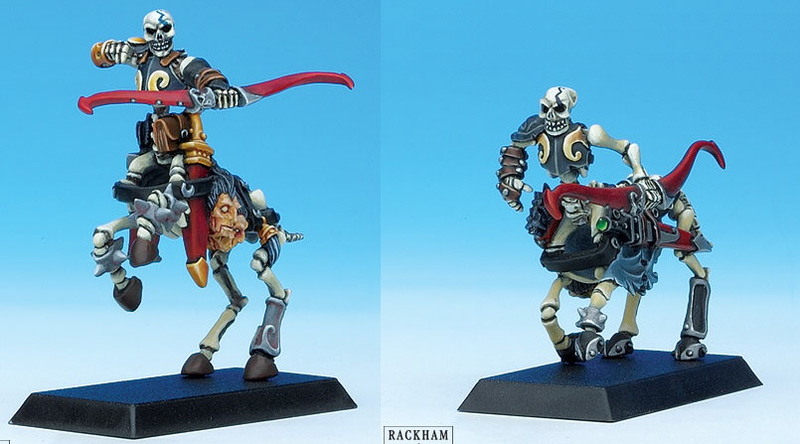 You should also take note that the models are closer to 35mm than 28mm. 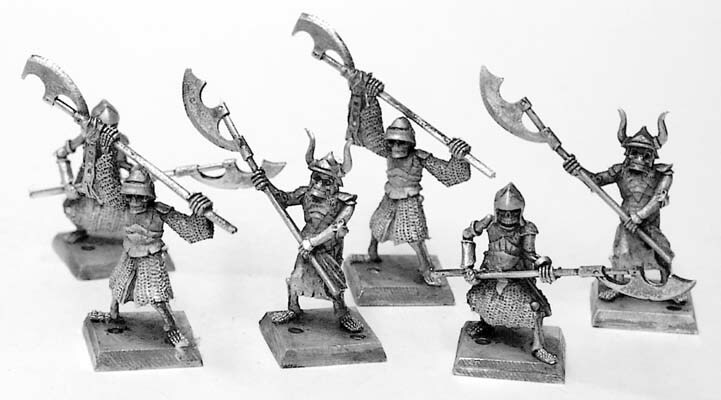 Two miniature ranges from a German manufacturer. DSA-roleplaying (The Dark Eye) and Armalion wargaming. 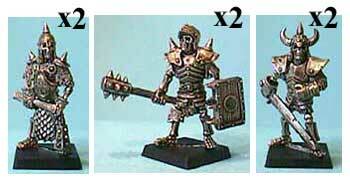 Warning: these miniatures almost always look better in the flesh than on pictures. Some are REALLY good. 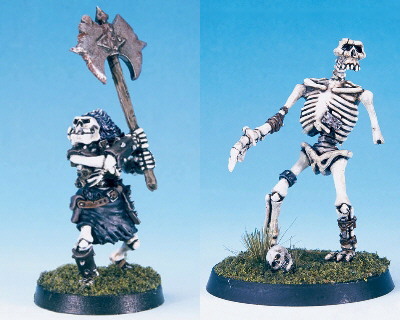 One of the best features of these ranges are the skeletal ogres. You heard me, ogre skeletons with 2 handed weapon. I have these in my collection and they're easily some of the best miniatures from this company. (Armalion 19304 and 19305). Sizewise they're about the size of a GW ogre. Naturally, they have a few regular skeletons as well. Downside: No slotted base. Shouldn't be hard to rebase them though. They produce hollowed out plastic bases for Armalion that will accommodate the DSA miniatures too. 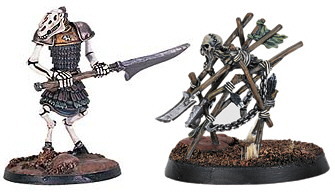 This company used to make some of the largest undead models ever to walk the face of the gaming table. 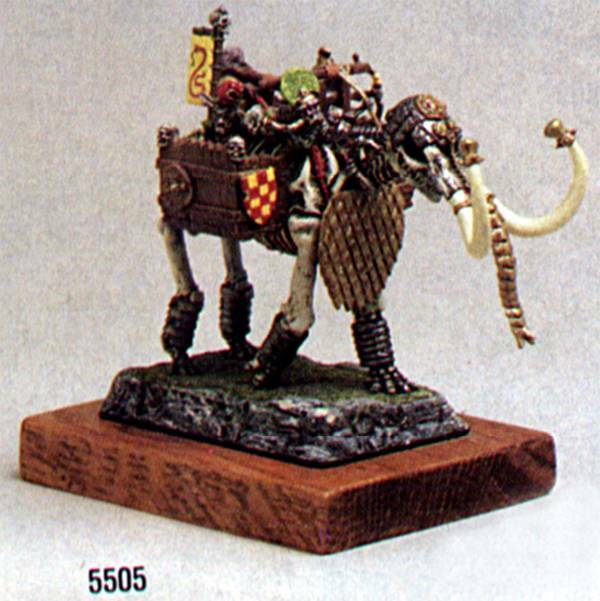 Some of their minis (the "Fantasy Warriors" ones) were later part of Stratelibri's "Nemo Miniatures", though that's not the case for the big ones. The Nemo models will become available again through EM-4 miniatures in the future. 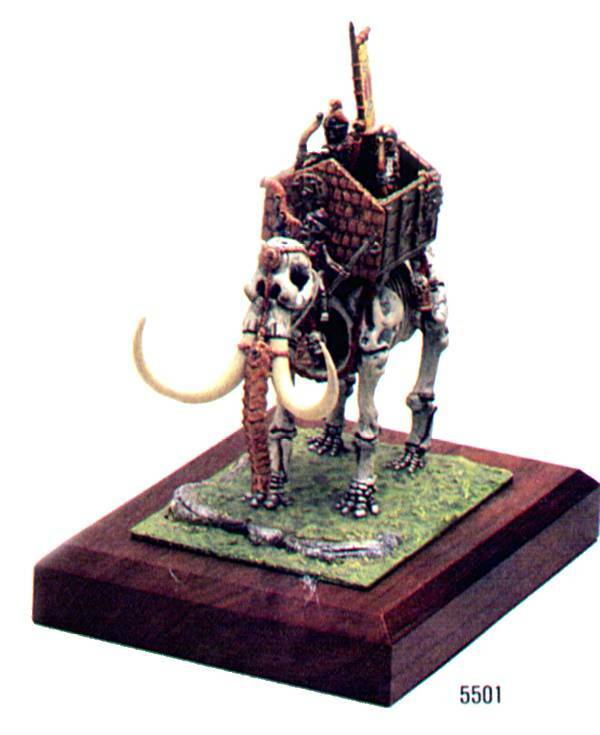 Among the older ones are such unforgettable models as the skeletal mammoths, the skeletal war rhino, the skeletal giant, skeletal dragon, etc... from the "Masterpiece editions". The Nemo models include mostly regular skeletons. Downside: They're OOP, so they're kind of hard to get. Don't hesitate if you find them! Nothing is certain yet about which models will be re-re-released by EM-4. Manufacturer of "Ad&D" en "Chainmail" miniatures. The "Chaimail" range especially carries some notable models. These come with plastic bases. 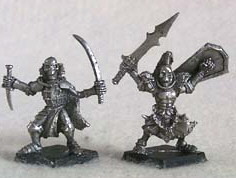 The older AD&D stuff comes with solid metal bases though. Site has pictures of some of the models, though you may experience some difficulty to find them. Downside: WOTC recently decided to cancel "Chainmail". The miniatures are still widely available though. Skeleton: "Forward! Forward! Cry havoc and unloose the Dogs of War! To the castle! Death to the mortals!" 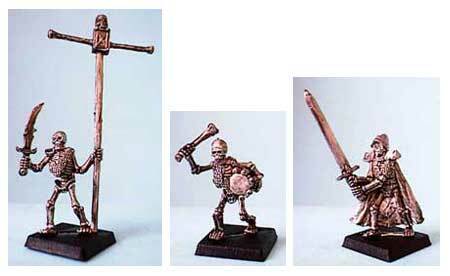 - Army of Darkness"
The "Celtos" line of this manufacturer contains a range of undead models. 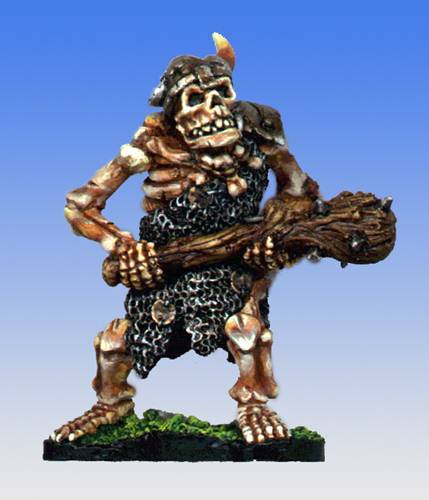 They are called "Fir Bolg, the Undead". Sculpting and casting is usually rather good on I-Kore models. They avoid cramming the figures with too many details, but this does not detract from the overall quality. 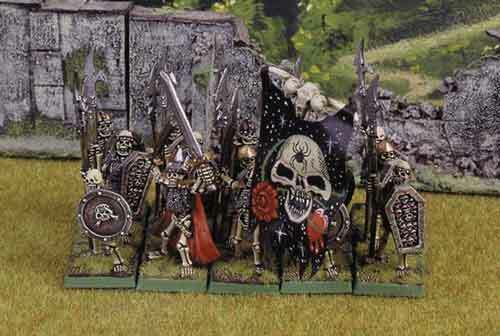 In the particular case of the skeletons though, I can't get rid of the impression that they appear to have 'heavy bones'. Bases are plastic and slotted. 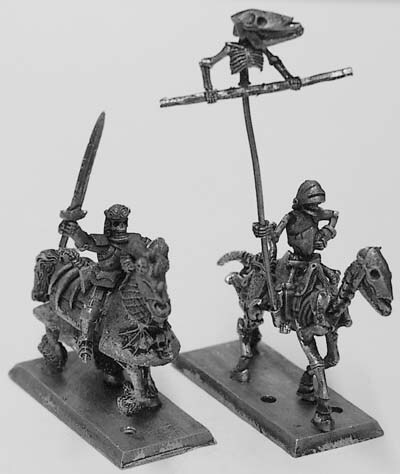 They offer a few interesting characters (a lord on undead steed, etc...), rank & file skeletons (of course) with spears, scythes, sickles, bows, as well as some cavalry.